It’s that time of year again – when everyone around you starts sniffing, coughing and generally turning into Vectors of Disease. Gross. So in between cookie comfort eating and digging out all of our scarves and thick jumpers, we’ve also been making sure our immune systems are working at full strength. This normally means chugging orange juice, eating eggs and lots of potatoes (classic ‘sick’ foods in our house) and making sure we hit the gym, but we’ve also discovered that kale contains quite a bit of Vitamin C and it’s currently in season! Score. 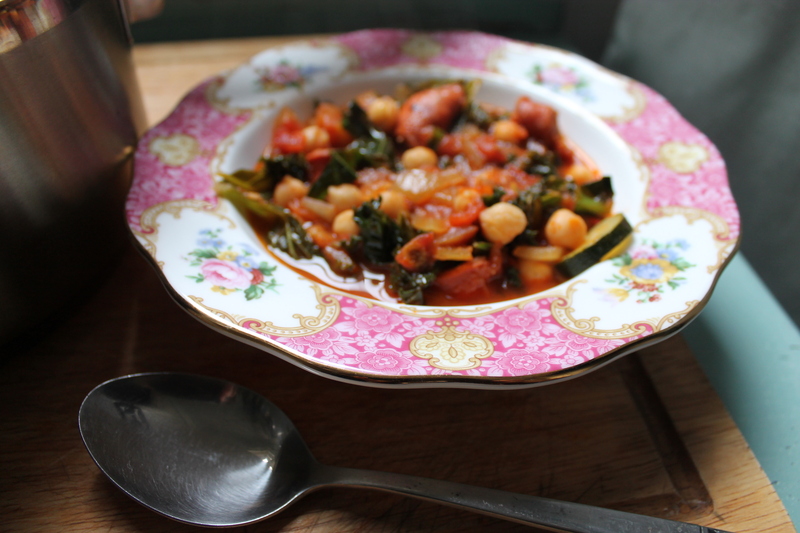 We’re not very familiar with kale as we never ate it growing up and we’ve hardly seen it in restaurants – but it is a lovely cabbagey vegetable so we figure making into a stew is a good option. And to go with the kale? 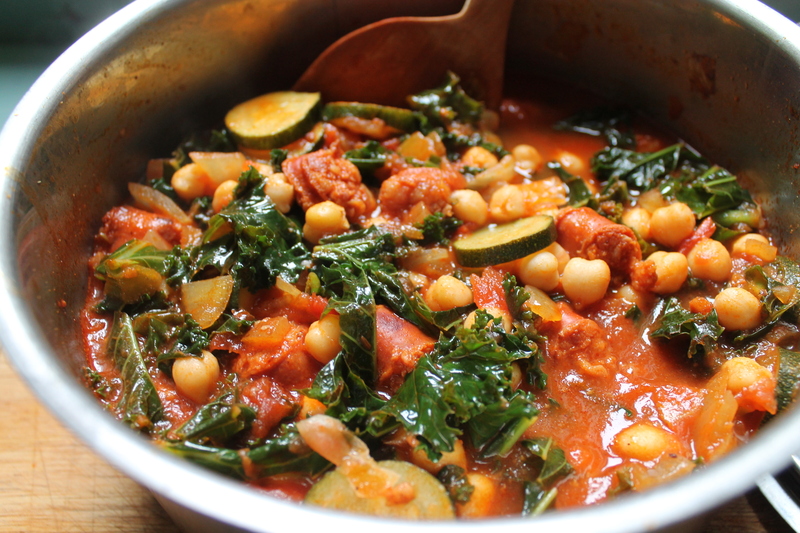 Well, chorizo and kale is a classic Portuguese combination and we also couldn’t resist Indian-ifying it with cumin, coriander seeds, chickpeas, garam masala, ginger and garlic. We also threw in courgettes (which we always have hanging out in our fridge) and harissa to give it a kick. This is a wonderful warming soup, super nutritious and full of interesting flavours and textures. Take that, germs! Heat the oil in a pan and add the onion. Cook until golden. Add the chorizo and cook on medium heat for a couple of minutes until the oil comes out. You’ll see what we mean! Add the garlic, ginger, spices and harissa. Cook for a few minutes and then add the tomatoes, plus the water and bring to boil. 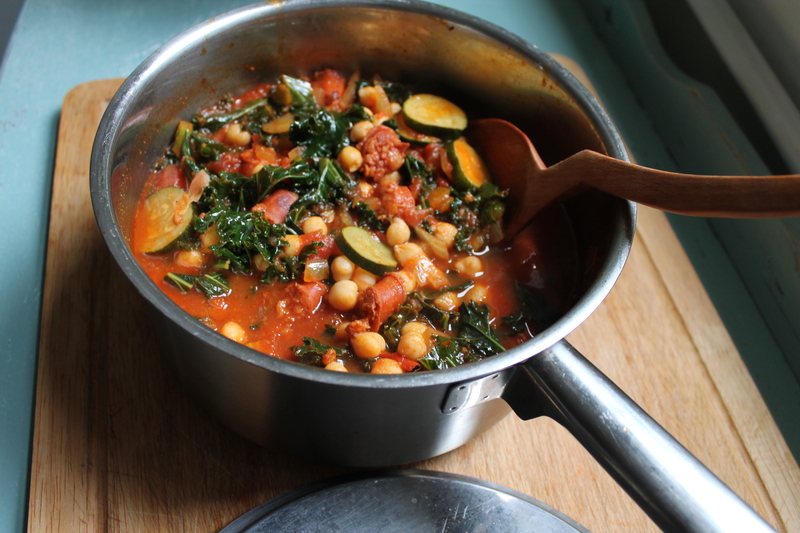 Season with salt and add the lemon juice, courgettes, kale and chickpeas. Cook until the courgettes are done, in about 10 minutes. If you like a thicker stew, you can cook the mixture until it is reduced by a third or you can serve right away – on its own or with some crusty bread. Yum!